South Korean football chief Chung Mong-gyu on Thursday apologized for the men's national team's performance at the 2018 FIFA World Cup, saying they need to improve their techniques. South Korea failed to reach the round of 16 at the World Cup in Russia, after finishing third in Group F with one win and two losses. The Taeguk Warriors, led by head coach Shin Tae-yong, beat Germany 2-0 but suffered a 1-0 loss to Sweden and a 2-1 defeat to Mexico. "I first want to encourage our players who produced a stunning win over Germany," Chung said in a meeting with senior football reporters at the Korea Football Association House in Seoul. "I'm sorry to fans that we failed to meet their expectations by not reaching the round of 16." Some fans blamed Shin's tactical choices at the World Cup as he deployed a lineup that wasn't even used during tune-up matches. 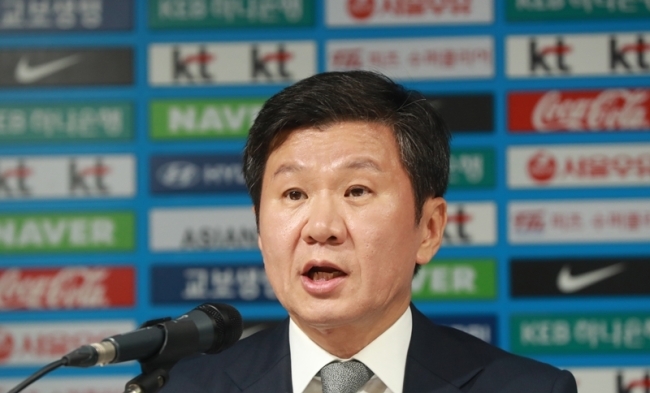 Chung, who has been managing the KFA since 2013, however, defended Shin's decisions. "I understand people's criticism of Shin's experiment, but his spirit of challenge and experience are denounced so much," he said. "He did find a talented defender like Kim Min-jae, and played players like Jo Hyeon-woo, Lee Seung-woo, Yun Young-sun and Ju Se-jong to expand options in the national team operations." Chung, who is a FIFA Council member, however, admitted that South Korea lacked techniques compared with other football powerhouses in the world. "Our victory against Germany is really an achievement, but it's important for us to win with our competitiveness on the pitch, not just with our fighting spirit," he said. "Technique is an issue related with youth football. I think players need to develop football techniques systemically from a young age." Chung said he was impressed by fans from Mexico and Germany during the World Cup. "I was impressed by their passion, and it was interesting to watch German fans waving their flags until they leave the stadium," he said. "I hope we can also make a healthy football culture without mockery." KFA General-Secretary Hong Myung-bo, who was also in Russia, said he learned many things from the World Cup as a football administrator. Hong was the captain of the 2002 South Korean team that reached the World Cup semifinals and was the head coach of the men's football team at the 2014 World Cup. "I came here with the homework of finding ways to develop South Korean football and its environment," he said. "For the last seven months, I faced many problems, but the KFA can't do it on its own. People should all think about the ways to improve." Kim Pan-gon, who leads the KFA's national team coach appointment committee, said that he felt the players were competing with pressure to meet fans' expectations. Kim and his committee members will convene a meeting later Thursday to discuss Shin's performance at the World Cup.